Cappiello pursued the posterist's goal with a clarity and purpose that set him apart from his peers, and it is with this poster that he firmly established himself as the master of the modern poster, and perhaps of modern advertising. He was the first to understand that if an advertising image is strong enough, the actual product does not have to be shown. 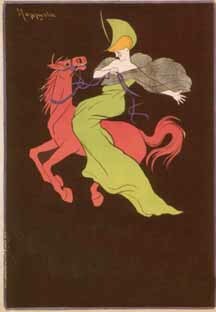 His symbol of the green lady on a red horse proved to so successful as a symbol that it remains the company trademark today almost 100 years later.